We have so much love for blue and white. This classic color-way is the perfect design inspiration for weddings, home decor, and everything in between! 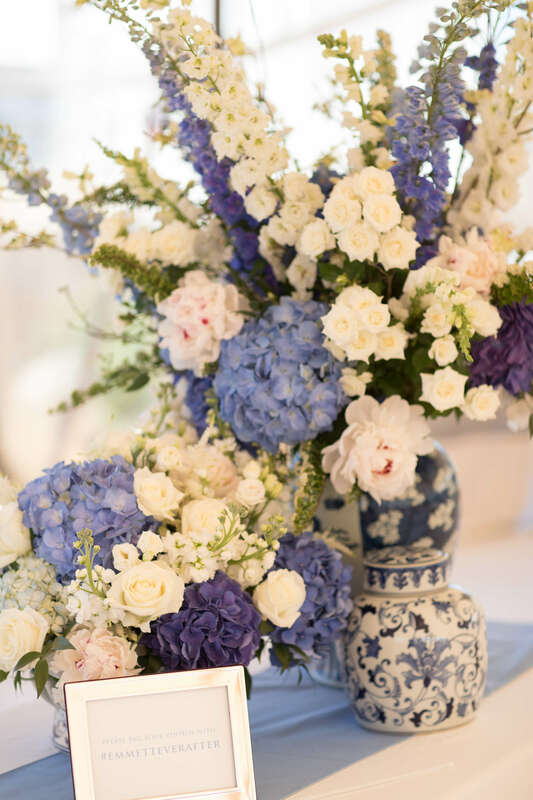 When we found out Sarah and Alex’s wedding colors were inspired by the fluffy blue and white hydrangeas that line the cobblestone streets of Nantucket, we were thrilled! 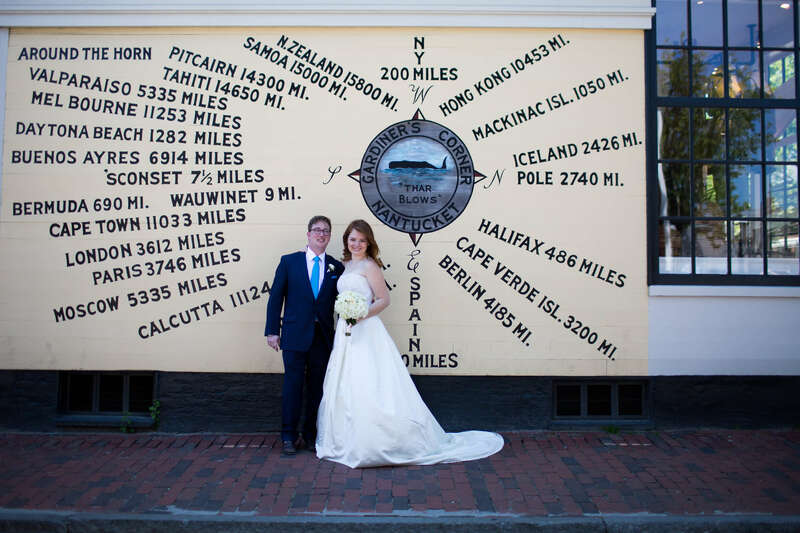 Last summer Sarah and Alex tied the knot on the sun-kissed shores of Nantucket. 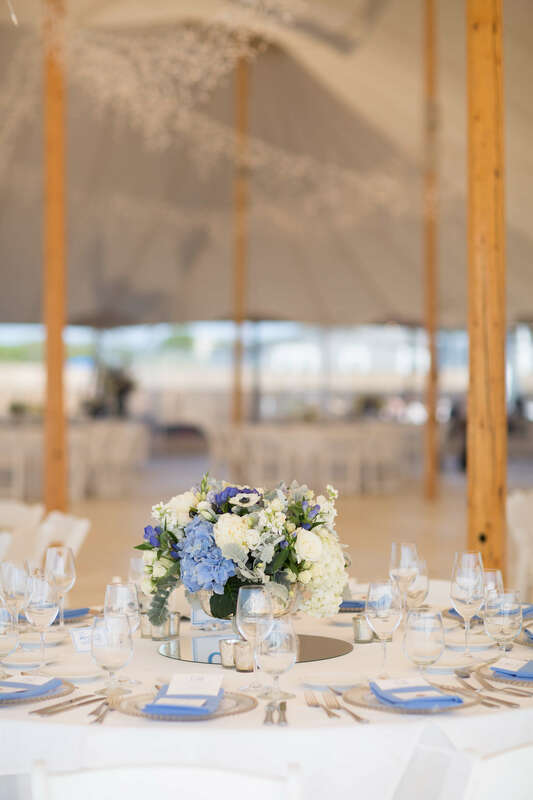 Galley Beach served as a stunning backdrop for their traditional blue and white Nantucket wedding. 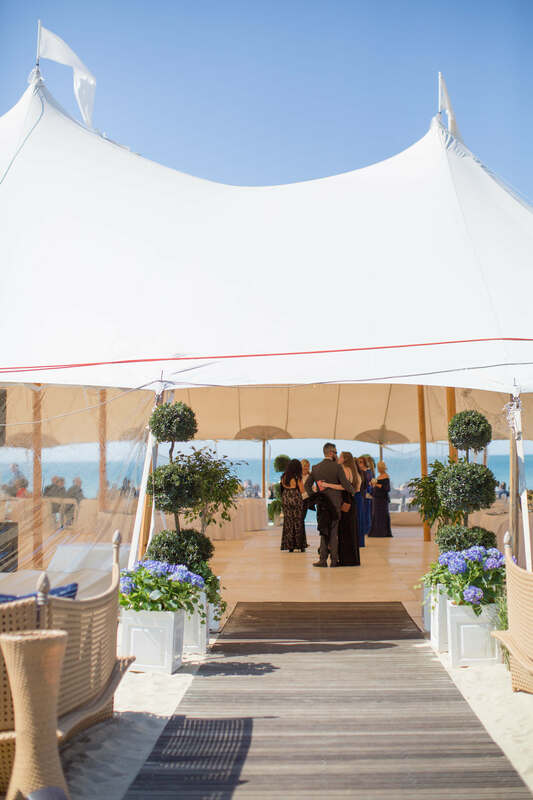 The tables at their reception were set in hydrangea blue and white, and included Chinoiserie accents to create a traditional, ocean-side setting. Flowers on Chestnut arranged the most beautiful centerpieces that included delicate white anemones, bountiful blue and white hydrangeas, and soft green accents. 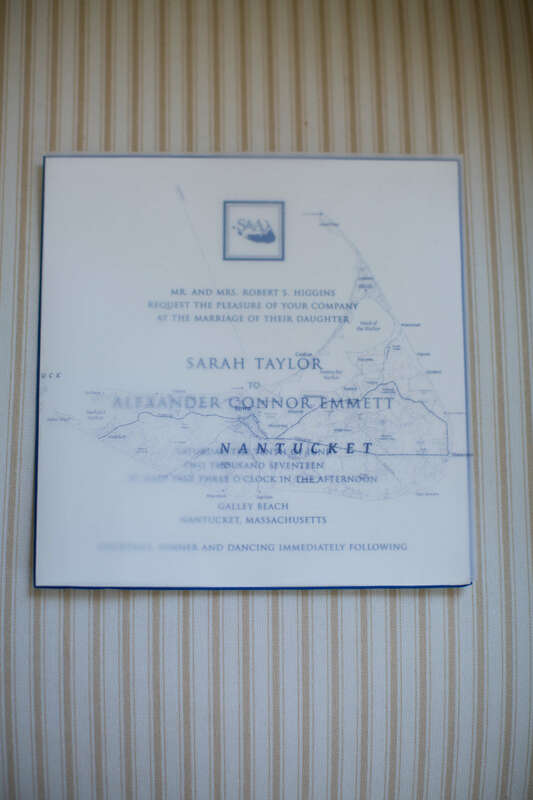 Sarah grew up spending time at her family’s home on the island, so special Nantucket traditions were also incorporated into different aspects of their wedding day. 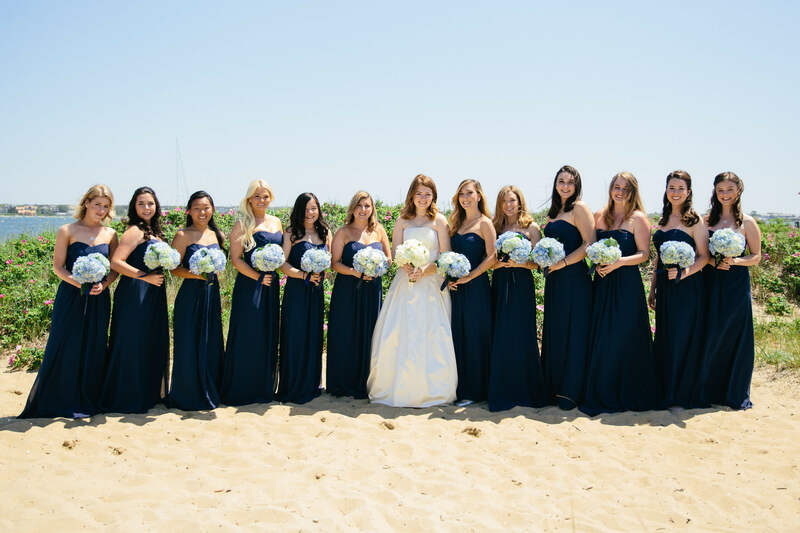 We love how everything turned out for this beautiful blue and white Nantucket wedding! 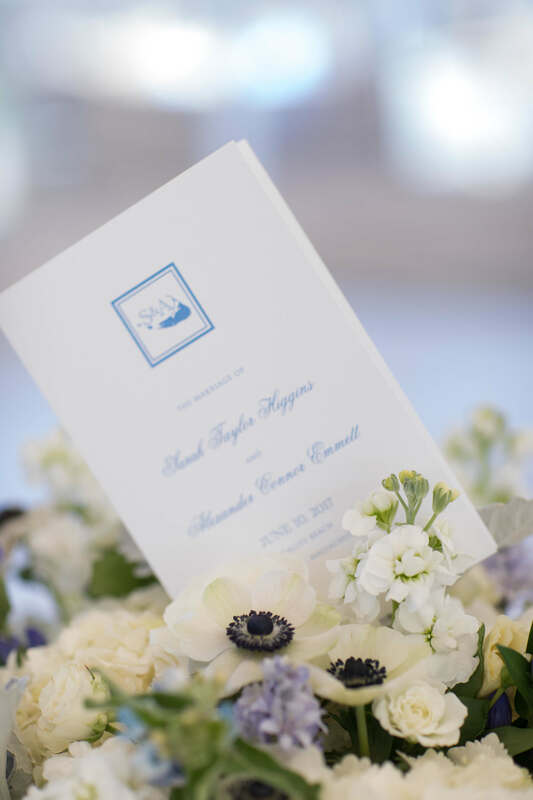 Sarah and Alex’s blue and white Nantucket wedding invitations were engraved in marine blue and prominently featured the couple’s Nantucket inspired wedding monogram. The design was both clean and classic, and featured beveled and painted edges as well as a traditional vellum overlay. 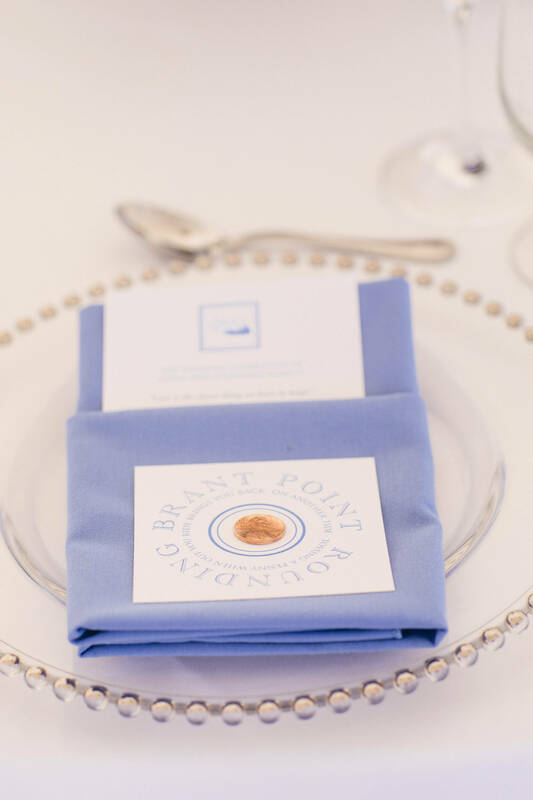 The vellum depicted a nautical map of the island and surrounding ocean, and was the perfect finishing touch to their invitation! 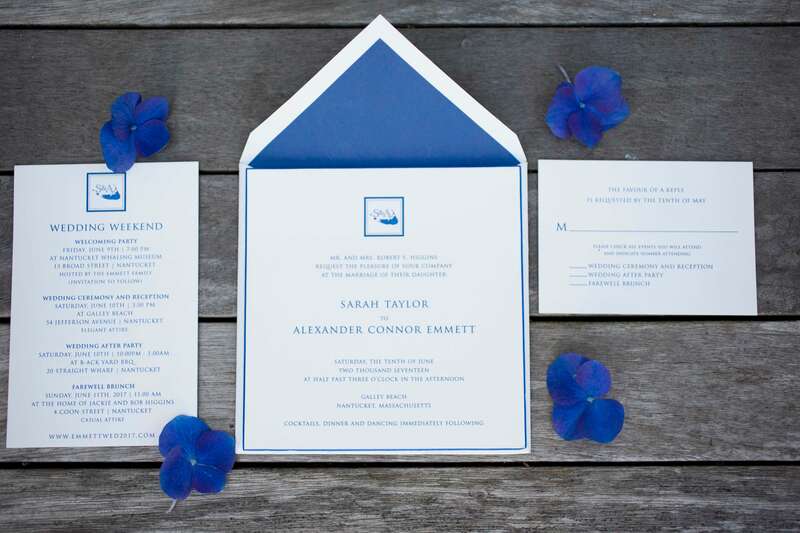 Each place setting featured a menu, which was printed in hydrangea blue and featured the couple’s wedding monogram. A penny card also sat at each seat, which highlighted a Nantucket tradition and had a penny adhered. When leaving the island by ferry, the tradition is to throw a penny overboard as you round Brant Point to ensure you return to Nantucket. 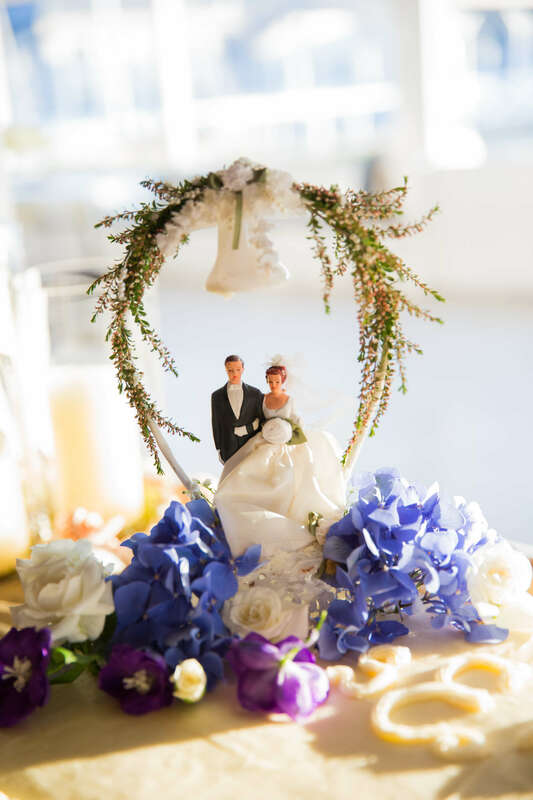 Sarah and Alex’s cake topper was vintage, and was used on Sarah’s grandparent’s, parents’, and aunt and uncle’s wedding cakes! 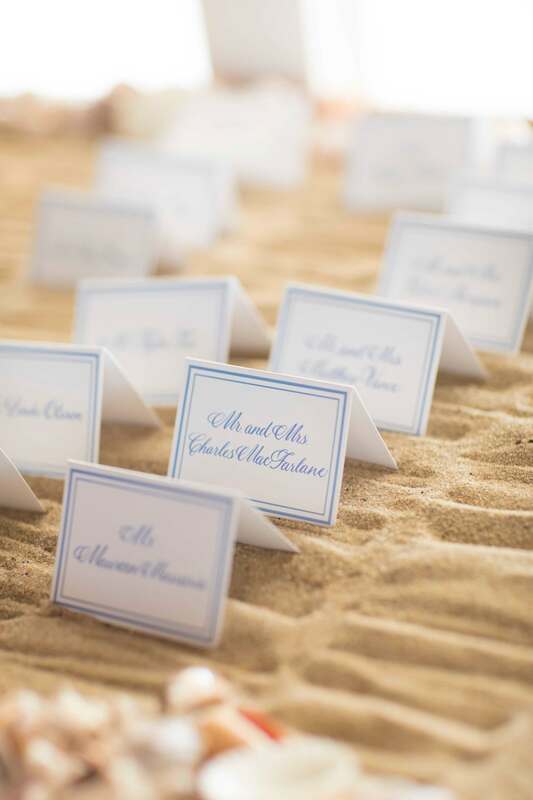 So much blue and white design goodness at this wedding! 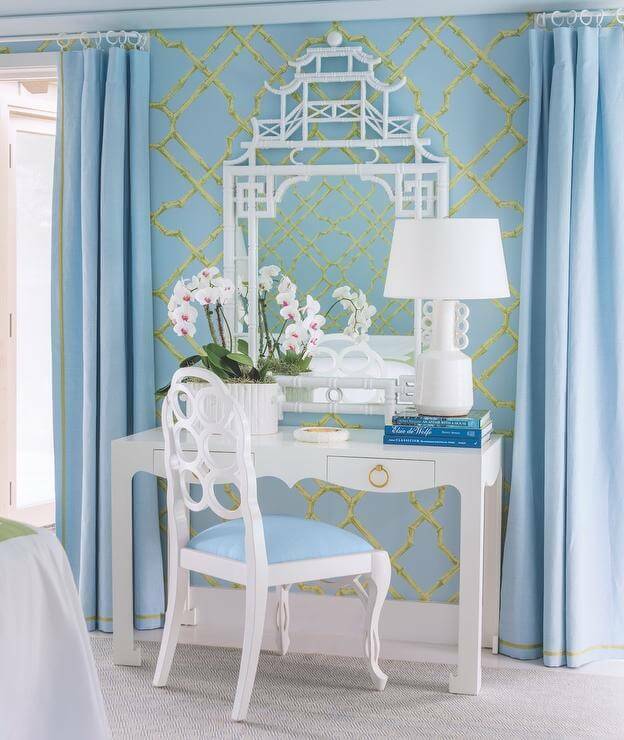 All this blue and white decor have us day dreaming of incorporating blue and white into our home design. We love that the colors lends themselves to traditional design, and can be easily incorporated into many different spaces. This entry way makes us swoon with all the blue and white accents! 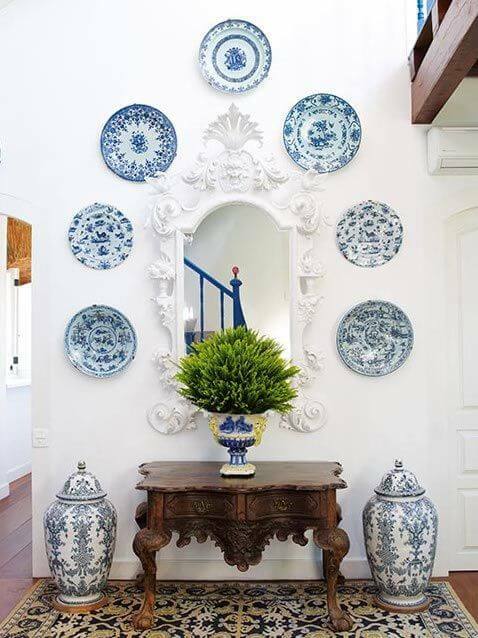 We love the combination of the Chinoiserie plates hung on the wall with the ginger jars on the floor. 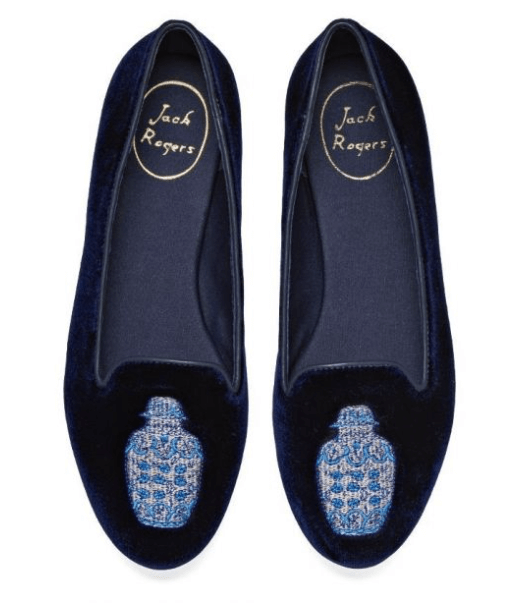 For true blue and white lovers, we can’t get enough of these ginger jar embroidered flats from Jack Rogers! Obsessed accurately describes how we feel about these velvet flats!! Looking for more blue and white inspiration? Then our blue and white ginger jar birthday is for you! 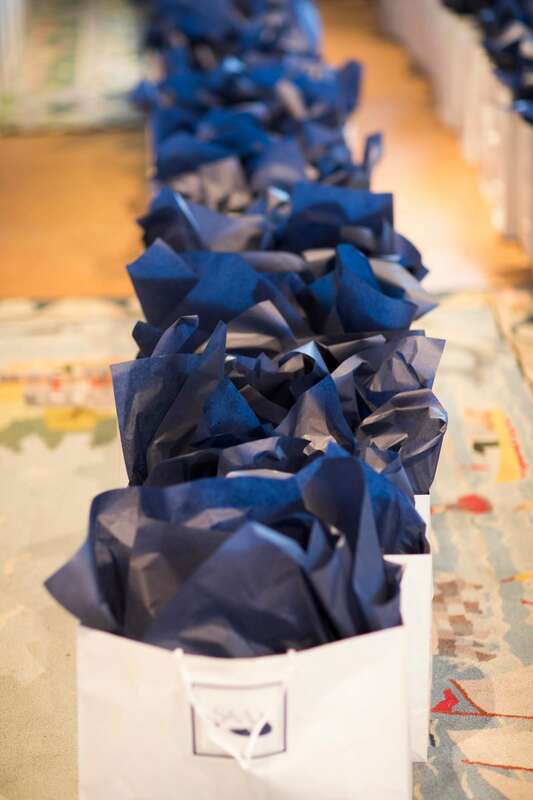 Inspired by Tory Burch’s New York City living room, this 40th birthday celebration is dripping in blue and white decor! 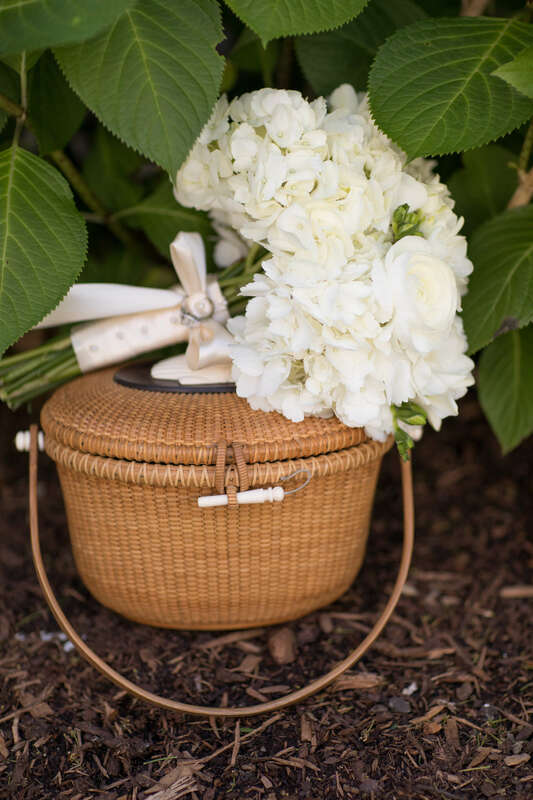 Want to see more of Sarah and Alex’s gorgeous Nantucket wedding? Be sure to visit their full wedding gallery on our website! !